The tabbouleh in this recipe features quinoa and is used to fill baked sweet potatoes for a great vegetarian main dish. Sweet potatoes are high in vitamin A, making them an ideal healthier substitute for white potatoes. Per Serving: 369 calories; 24g fat; 35.8g carbohydrates; 4g protein; 0mg cholesterol; 197mg sodium. 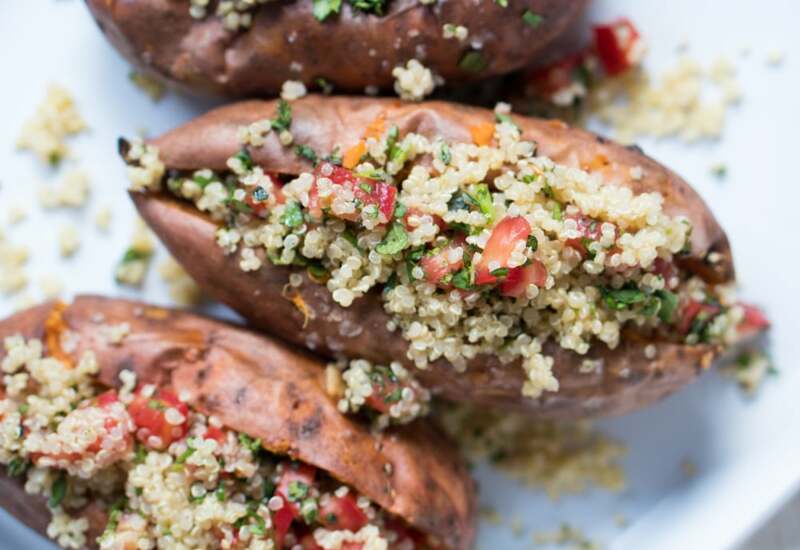 I don't what I love more, the quinoa tabouli or the fact that I stuffed them in a sweet potato to make this dish! So delicious, love it. These loaded sweet potatoes are on regular rotation at my house. The quinoa tabbouleh is fantastic, and tastes great with by itself too. I used multicolored quinoa and it was great.